A must visit in South Beach for seafood fans. Outstanding dishes at comparable prices for fine dining restaurants. The portions aren't huge, but you get a ton of .. Ocean's Ten is a great place for both a dining and nightlife experience in South Beach. They have an extensive food menu and a long list of signature drinks ..
Pros: The atmosphere with an outside patio for dining and dancing all night. Cons: Cover charge later at night. South Beach, a section of Miami Beach, is also referred to as SoBe. South Beach nightlife has made Miami such a popular destination for spring break travelers. Nightclubs in South Beach change names & ownership so much that it is impossible to keep up with which South Beach nightclubs are the most popular. You will find over 150 dance clubs & bars in South Beach. Hungry? You will find plenty of great restaurants in South Beach Miami, something for any craving. Take a stroll down the famous Ocean Drive which is home to many famous bars & restaurants as well as beachfront mansions. 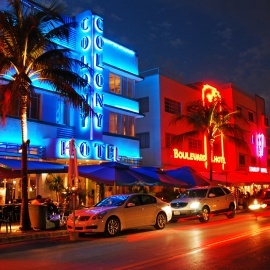 But if you are looking for a night out on the town, South Beach nightlife is the place to be! Mas tequila! Celebrate all things Mexico with this alternative Cinco de Mayo crawl! Our annual ULTIMATE CINCO DE MAYO PARTY is at Naked Taco!